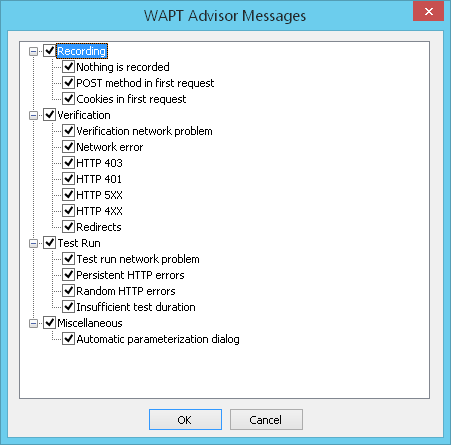 WAPT Pro has a special Advisor which displays a prompt message in case some trouble event occurs (nothing is recorded, or network error occurs, or test duration is insufficient etc). The list of possible trouble events is displayed in WAPT Advisor Messages dialog which opens by clicking the Advisor messages... button in Prompts settings. Here you can specify which messages will be shown by the Advisor - check/uncheck items in the dialog above. There are several items for Recording, Verification and Test Run. Miscellaneous > Automatic parameterization dialog: This prompt message is shown in case the list of search results is empty in the Parameterization dialog (this dialog opens by clicking the Parametrize button in request properties). You can click the Ask for assistance... button in this dialog to send the assistance request to WAPT team.